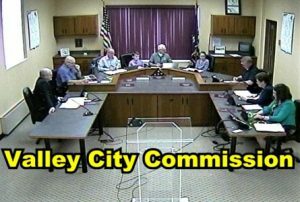 Valley City (CSi) The Valley City Commission met in Regular Session Tuesday evening at City Hall. Commissioner Powell was not present. PUBLIC COMMENT: No one spoke. City Attorney Schoenack explained Ordinance amendments. The second and final reading of Ordinance No. 1037, an Ordinance Amending & Re-enacting Title 3, Health & Sanitation. The second and final reading of Ordinance No. 1038, an Ordinance Amending & Re-enacting Title 19, Disasters & Emergencies. Approved a Resolution to approve the terms and conditions set forth in the Commitment letter with the Bank of North Dakota to Provide $3,289,400 in Financing for the local share of Phase I Permanent Flood Protection. Emma Tufte presented the city’s Website Project with a power point. She says the new website is more streamline, and mobile. Approved a Visitors Committee recommendation for a $15,000 match, for Image Enhancement Grant up to $15,000 for Historic Image Enhancement Grant for Erin Hannig at 142 East Main Street, for a new bakery. Approved a Renaissance Zone Authority Board recommendation for 5 year income tax exemption and 5 year property tax exemption for the full assessed value of the property being rehabilitated at 142 East Main Street, designate it as VC-110. Approved was the cost share agreement with the State Water Commission, for the Design engineering of the Phase III & IV Permanent Flood Protect, as explained by Chad Petersen, from KLJ. Considered was customer credit card usage costs and a surcharge. City Administrator Schelkoph said credit card charges take away from revenues. The proposal is a 2.19 percent surcharge, on credit and debit card usage. Cards accepted are MasterCard, Visa, and Discover. Cash a checks are also accepted, as well as automatic withdrawals from accounts that can be set up. A motion was made to approve, which failed on a 3-1 vote with Mayor Carlsrud voting in favor of the surcharge. Considered was a contract for garbage hauling from the transfer station to Fargo landfill. City Administrator Schelkoph said savings could be made by a city employee at the transfer station bringing the garbage to Fargo. He said costs were estimated for leasing a vehicle, gasoline and insurance and maintenance costs. The City Commission unanimously approved a one year contract with the hauler, Ken’s Sanitation, in order to give the city the opportunity of about one year, to implement the new plan. Considered was paving the library parking lot. Commissioner Bishop said the estimated cost is between 80 thousand and 90-thousand dollars. The cost would be around $30,000 if divided three ways, with entities under consideration, the city, the library, and the county, and school district. The City Commission voted to table, and study the feasibility of funding the project, with other entities. Considered two voting members for Valley City-Barnes County Development Corporation. Mayor Carlsrud said, currently the City Commission has no voting rights on the Development Corporation issues. The Commissioners voted unanimously to approve. Approved was a Special Alcohol Beverage Event permit for The Labor Club in parking lot on August 25, 2018 from 5:00 PM to August 26, 2018 at 2:00 AM. City Fire Chief Gary Retterath re-stated the recruitment effort continues for new firefighters. KLJ gave and update on street and permanent flood control projects. Mayor Carlsrud noted improvements and investments in Valley City. He said that school opens Wednesday, and urges motorist to use caution.